Voyager of the Seas (Royal Caribbean) is one of the largest and most exciting cruise ships to come to Australia. The Voyager is 138,000 tons and accommodates up to 3114 passengers. 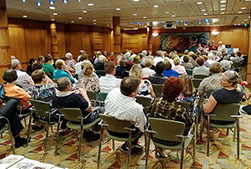 Our group will have exclusive use for the entire cruise of three of the four rooms of the 330 seat conference centre. Two of the rooms will be opened out for presentations to the entire group. The third will be used for a second parallel stream for about half of the time. 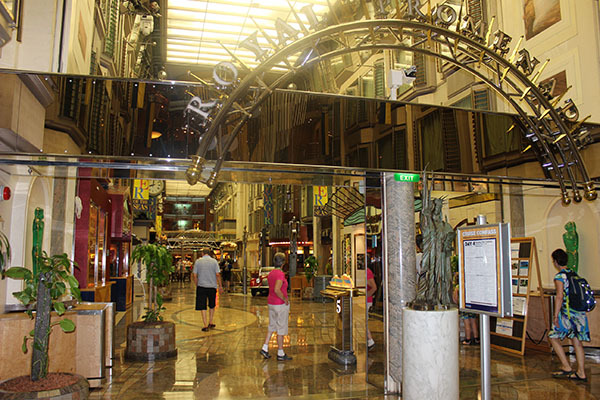 Voyager of the Seas is a large floating island resort that berths at the few ports large enough. It has all the signature features of Royal Caribbean International – including huge Solarium, ice-skating rink, rock-climbing wall, huge Showlounge, shopping malls and street entertainers, to illustrate what you can expect. The ship is family-friendly, with large facilities for children and teens. It caters for large conferences, wheelchair access, and also couples wishing to tie the knot in the wedding chapel. Though large, the ship offers a good passenger space ratio. Décor throughout is warm and attractive and you’ll need good walking shoes to become familiar with the many public spaces. Some cabins have interior views overlooking the shops and cafés. 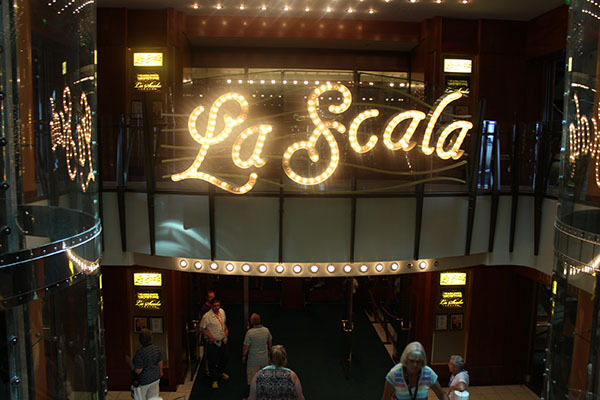 Though carrying over 3000 guests, dining, entertainment and activity centres are spread throughout the ship. Staterooms come in four categories and multiple price grades, depending on position. An inside cabin (starting at 160 sq.ft.) has twin beds (convertible to Queen), private bathroom and sitting area, TV, hair dryer, safe, phone, and mini fridge; and others overlook the interior Royal Promenade. Outside staterooms (starting at 180 sq.ft.) overlook the ocean, and some larger cabins accommodate six persons. Three hundred cabins have inter-connecting doors. Balcony staterooms (starting at 173 + 47 sq.ft.) view the ocean, and may include a mini-bar. Travel in style with a selection of five categories of Suites (starting at 277 + 69 sq.ft. ), which are specially good for large families needing more space, and may include complimentary concierge service and access to the concierge club. Depending on the suite requirements (up to 1,188 + 170 sq.ft. ), you may have a king size bed, two bathrooms, whirlpool bathtub, baby grand piano, an entertainment area, and accommodate up to 8 guests. Smoking is only permitted on private ocean view balconies of balcony/suite staterooms. The ship has a variety of dining options, including a spectacular three-level main dining room with three separate and distinct themed dining areas. A Traditional Dining option allows preselection of your ideal dining time at the main or second seating, for the duration of the cruise. Alternatively, reserve seating in the main dining room with the My Time Dining program (and pre-paid gratuities). Menus feature healthy, vegetarian and kosher options. Menus change daily throughout the cruise. There are three distinct types of dress onboard: casual, smart casual and formal. Room service is available to all guests for all meals (a late night service charge applies). The buffet Windjammer Cafe is open around the clock, serving salads, soups, sandwiches and burgers, meat-carving, hot entrees; and for extras cookies, cakes and frozen yoghurt. Try Island Grill for a casual dinner. Johnny Rockets is a 50’s style burger joint. At the sidewalk Cafe Promenade get a quick bite or pizza with a cappuccino, or a light snack at the modern coffee bar Latte-tudes. Stop at Ben & Jerry’s for ice-cream and frozen drinks. The stunning 1,350-seat Showlounge, spanning the height of five decks. Productions are Broadway-style. Studio B has 25,000W of power for sound equipment and 18,000W for lighting equipment, and presents ice shows and ice-skating, comedy, game shows, onboard parties, and cooking demonstrations. (When the rink is not being used, skate for free!) The ship hosts special parades onboard to celebrate your vacation and get everyone in the mood to just let loose and enjoy. Parades feature characters from DreamWorks animation movies. Live music features around the pool, in the main dining room, and in many lounges, bars and specialty venues. Gaming is in Club Royale. There are additional programs to suit every taste. Sports facilities include an outdoor sports deck, complete with golf course, driving range and golf simulators, as well as a roller blade track and a full-sized sports court for basketball, paddleball and volleyball. The Fitness Centre has all the equipment that major sports clubs do. There is also a rock-climbing wall and scuba diving course. Large facilities cater for children and teens, and large conferences.